When the legendary German outfit Accept decided to split up back in 1987, many people, myself included, felt that a great chapter in the history of Teutonic Metal was finally closed. Well, it looks like vocalist UDO Dirkschneider had other plans in stall for us, having since created a number of successful albums under his moniker, the latest of which is a modern-sounding heavy metal release that goes by the name 'Mastercutor'. After a very pleasant chat which included subjects such as beer, schnitzel and the current borders of Germany, the friendly frontman revealed to us the secret recipe behind 'Mastercutor', his plans for the future and the prospect of witnessing another Accept reunion. OK, Udo, thanks for doing this interview with us. The way I figured it out, the new album is more like a statement, rather than anything else. Is it true that what you are trying to say is that you are still here to stay, having released such as great album as 'Mastercutor'? U.D.O: Yes, my intention behind this album is to show that we still have the power within us and that we are not dead yet, just like Mastercutor. He is the show-master and the whole album talks about the games, the reality stuff he is going through and he has survived. This reflects the idea that I am not dead yet, in the music business. It is interesting to hear a person like you coming out with a statement like that. Is it a fact that in 2007, even someone with a track record such a yours still has to work hard in order to maintain the interest of the people? U.D.O: I believe in a way that this album is different from all the other ones. What we did was to try to make it more modern sound-wise, but the music is still the same. But we also did some different arrangements to the songs and what I think happened with this album was that we tried to write music as we did in the old days, when we started with Accept and UDO. What people are saying is that UDO has its own style�Thank you very much, I appreciate this (laughs), but it is still also have Stefan Kauffman with me, who was a member of Accept. Many people nowadays are not aware of Accept, all they know is UDO. In a way, this album is a new change for us, especially with the sound, and we know that with the next album we can do different things and much more, making it much more interesting. Everything is so round with the new album: picture-wise, album cover-wise, music wise. In a way, this is different from the previous album. So far I have done quite a few interviews and all the people have really said: 'Yes! This is good!' This is really positive for us; this is the right step. The sound is definitely one of the strongest assets of the new album. I don't know what Stefan was thinking when he was recording it. U.D.O: It was not only Stefan. Both the 'Thunderbolt' and 'Mission No.X' albums had some very good songs on them and the productions were also good, but we were being too 'safe' about things, not changing many things and being careful. But the sound engineer, he is now working with us for three years and he said 'Why don't we try to do things a little bit differently, try something a little more modern?'. He has been working with us on our live sound and he was doing a good job with it, so we told him: 'Well, if you have some ideas, come down to the studio with us and show us what you mean'. So I have to say that 50% of the sound should be attributed to our sound engineer. In retrospect, I think it was good to have someone working with us from the outside, putting some new ideas forward. I like the idea of having done something really new and this album is very strong, straightforward. The vocals are some of the best that I have done for UDO: very strong. And you can really see the fun on this album - I don't know, I really like it! I also believe that there is a variety of dynamics, the way you combine fast and slow songs throughout the album, it keeps the interest going the whole way through. U.D.O: But this is also interesting. Take the song 'Tears of a Clown' for example, a song with a piano theme and plenty of emotion. Combine it then with a song like 'Master of Disaster', which is as close to a thrash song as is possible and you can understand what I mean when I say that this is an 'all rounded' album. Did you find it difficult to bring this album to life, or was it really relaxed working in the studio? U.D.O: Yeah, I mean in a way, it was really easy! We have been working in a different way since the release of the 'Man and Machine' album. Normally, we start with riffs and put the lyrics and the melody is on top of that. But since 'Man and Machine', we first put the lyrics and then place the music over them, in order to get the right atmosphere. With 'Tears of a Clown', this is what happened and now we know that this is how we want to make songs. With the help of our live engineer in our studio, we had more ideas coming though. It was far easier and more relaxing. I see that you place a lot of importance with the lyrics, always striving to put across the right message and not us them as filler to your songs. U.D.O: Yes, that is indeed the case, this may not be a concept album in the strict sense of the word, but there is a general theme connecting these songs. With the song 'Mastercutor', we are referring to all these stupid reality shows on TV. I remember walking into my son's room one day and saw a very scary face on the screen of his computer. That was when I got the idea about the album cover, and based on that, we created the idea of this show-master, and the very weird intro of the album reflects perfectly this idea. So far, we have so many ideas for a live show, to do a visual production for 'Mastercutor'. First we need to know what kind of venues we will be playing, though, before we decide. 12 very good songs, 12 very different songs, yet you chose 'The Wrong Side of Midnight' for the single, which has a certain Oriental feel about it. This is not what one might consider to be a typical UDO song. Why this song, then? U.D.O: For us, the single was supposed to be 'Mastercutor' at the beginning, but after listening to the whole album, quite a few people, the label included, came to us and suggested that we use 'The Wrong Side of Midnight' for the single. This is a very interesting song, the melody of which was created by Stefan one night. He called me at two o'clock in the morning, somewhat drunk, and told me:'Listen to this!'. He came round the next morning with it and played it again and when we listened to it, we thought: 'This is so stupid, we need to leave it in!' Thinking about it, it is possible to compare it with some of the older Accept stuff, such as 'Fast as a Shark'. You have a very specific sense of humour which always came across in your music. U.D.O: Yes! The beginning of the album is also unusual. It was so funny, we were laughing and we said: 'Ok, it fits completely with the song!'. Everybody said that 'The Wrong Side of Midnight' is one of the strongest songs of the album. We then also decided to make a video for this song. This was not easy, though. The first idea for a video was for the song 'Mastercutor' - perhaps of a game-show, or something like that, then everyone thought that The Wrong Side of Midnight' was a much stronger song. But how to do a video for this, another 'Lord of the Rings' with elements of Egypt etc.? So we finally decided to base our video on the birth of Mastercutor. First, you see a normal face and then a lot of experimentation with his brain and then he gradually becomes the Mastercutor, the way you see him on the album cover. Then he becomes really mad, looking for a stage, an audience where he can present his madness. In this way, we put both ideas in together. To explain this video is impossible, you really have to see it for yourself! So where can we find this video - will it be included in the limited edition of the album? U.D.O: Definitely, on the limited edition and, hopefully on TV, but I don't think so! Well, it's kind of difficult nowadays for metal videos to get proper air-time. U.D.O: Maybe you'll be able to see it on the website of the label, but definitely on the limited edition. Making a music video requires quite a lot of money, do you believe it is a worthwhile investment for promotion purposes? U.D.O: Errrm, I would say that in so many countries where we play, definitely in Eastern Europe - Russia, for example and in South America, they play this kind of stuff. The last video of UDO was very well played in Scandinavia, South America, Spain etc. I mean, we are not only making a video for Germany. We hope they might play it in England maybe, but they are not really made for some countries. Also, with all the modern technology on the Internet - I don't think it is a waste of money. From the 12 songs on the album, which is the one that you feel closest to, and which is the one that gave you the most trouble as far as the recording is concerned? U.D.O: What are my favorites? Hard to say, but I really like 'The Wrong Side of Midnight' and for me, personally, I really like 'Tears of a Clown', which is a very personal song. The story behind it is that the clown has to make people laugh in the circus tent under any circumstances. As a musician on stage, you can't say: 'I'm not in a mood today, I have problems at home'. You always have to make sure that the 'show goes on' and I have had some personal experiences with my mother when she had cancer and I had to do the Bang Your Head festival and I knew that she was dying. I had to go on stage, do the show (that was the 'Man and Machine' tour), and then rush to the hospital, and these are things that do not matter to the people, as the show must go on� What the song 'Tears of a Clown' is trying to say is that nobody is interested in a clown's tears, you know, and this is a very emotional, personal song. I was going to say, that even from the Accept days, all your ballads were always very sad and very emotional, which is sort of strange for someone with your vocal style. 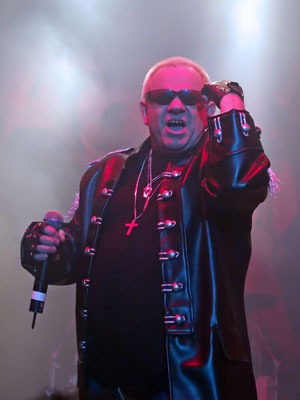 U.D.O: I did an interview many years ago here in England, when a reporter told me that the best ballads come from Metal music, and he was right. 'In the Darkness' is a perfect example of such a ballad. To answer your question, it's always full of personal things, emotional stuff, and that is why I think the ballads of Metal bands are always from the heart. On the previous UDO album 'Mission No. X' there was no ballad, but on this one, we decided to do a different kind of ballad, based on a piano theme, which is also performed by our live engineer. We also added some cello melodies to this song, which added to the overall sound. We wouldn't have done a song like that two years ago, but nowadays, when we write a song, we always make sure to add exactly what it needs in order to feel right. Nowadays, it doesn't matter that, as a metal band, what instruments we use, as long as we can perform the song live. With modern technology, you can add any instrument you like to your song during the recordings, you can even make your guitar have the sound of a cello. This gives us more freedom to write a really good song, with all the instruments we feel fit. Why do you think, in this day and age, do we not have any more 'great' bands? Why are there no more 'Accepts' or 'Iron Maidens' or 'Judas Priests' out there? Do you think it is because modern technology has made artists lazy? U.D.O: I don't want to say 'lazy', there are a lot of interesting, good young bands around, but I can say that they often lack personality. For example, when you see Ronnie James Dio on stage, you feel a strong personality, or Bruce Dickinson, or Rob Halford, for example. But most new bands, I think they miss the point of what we are doing, which is entertaining. Of course, everyone can be a real character, it's the same with actors in movies - for example, you have Marlon Brando, you have a really strong personality. Some people have 'something', but the new generation doesn't seem to be into the entertainment aspects; they play good music, but this part is missing. Record companies tend also not to allow young bands to develop, it's all about quick money nowadays. A lot of bands are gone within a year; it seems that they forget that if you really want to be somebody in this business, you really have to work. Is it perhaps too difficult to come up with something new and fresh in the Metal industry after so many years? 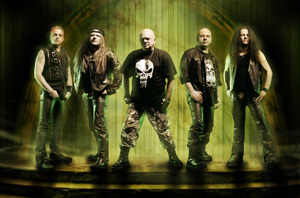 U.D.O: It is not easy, but that is not the only point; you must have a really good front-man with a unique voice. I know quite a lot of singers who can perform many more vocal melodies than I can, but if you put them on, you have no idea who they are. I believe that luck is also a very important factor in this, it is not only about money and the support of the record label. The key is being unique. Let's go back to 'Mastercutor'. What are your plans for promoting the album, apart from the interviews that you currently doing? Are you going on tour any time soon? U.D.O: We start in Mexico on the 21st of May, we will do a couple of shows there and then come back to Europe. Then the whole summer - festivals, up to the beginning of September and then we will start the European tour. We will go back to South America - normally it would be better to go there straight after Mexico, but we could not cancel all the summer festivals. We will then go to Russia. The plan is that the European part will go on until Christmas and then we have to do Asia, we have an offer to go to China - that should be very interesting and our next big market. Also, we have had offers to do America after a very long time, this to include Canada also. So the whole process should last until March 2008. How can you cope with a whole year of touring? U.D.O: Well, we have a few short breaks in between. I feel healthy, I don't have any problems with my vocals and yeah, the most important thing for me is that I have fun. If that stops, I will have no reason to carry on. In terms of achievement, I achieved everything I wanted to with Accept. I'm still looking forward to the new albums coming out, I'm still nervous to see what other people think of them. Still a bit nervous on stage - not so much as when I was young, of course! But if I ever get the feeling that I do not want to go on tour, I will stop. After all, if I really want to make money, I would do a reunion with Accept. We had so many people offering money for that. Why did you go to Wacken with Accept then? U.D.O: Actually we did a whole tour with Accept that summer in 2005. A lot of promoters were asking me if Accept could play, but I never had time with UDO. So in 2005, I had a break with UDO and that was the right time to do the Accept shows. It was all about satisfying the fans who were asking to see Accept again live and the other reason was for me to find something out - whether there was something left out there for the band. Was there anything, after all? We played all the classic songs up till the 'Russian Roulette' album, but nothing from the new period. There was a lot of fun on stage. I think the people enjoyed it, but there was nothing to give us an indication that we needed to do a new studio album. So I think everybody felt the same. Nobody was coming up to us saying 'You have to record a new album'. The good thing was that I had a chance to do the Bang Your Head Festival with UDO and the Grasspop festival with Accept and we played some Accept songs at Bang Your Head. If you think about it, what is Accept? It was always me and Hoffmann and when I played the Accept songs with UDO, they sounded better than the other way. The chemistry was not there any more. When people asked if they could expect more from Accept, I said, yes, of course, we would do some more shows in the future for our fans. But no studio album and no proper reunion. It was very sad when we were performing at the Wacken show that the recordings we made for a DVD went all wrong. I told them that we, as a band, we should have been a bit more involved in the process. The result is that we have some very good footage, but the sound is very bad. I don't want to go into the studio and re-record everything now! The only thing you can see from that show are the parts that are included in the Wacken DVD for 2005. It is a shame, but we may do some more shows in a couple of years. But before we do so, we will talk t the right people and record things properly. For me, though, the only important band is now UDO. How would you describe the people you work with? U.D.O: A really democratic organisation. Very nice people - we are like a family. I always compare it with the period of Accept between 'Breaker' and 'Metal Heart'. It is like deja vue. I was talking about this with Stefan, with whom I've been playing music for 25 years now and he said 'I feel so comfortable in this band. It has the same feeling as Accept'. Everything works perfectly at the moment, like magic - we don't even have to talk to each other and things happen by themselves. Are we to expect many more albums from this line-up in the future? U.D.O: Yes, definitely, at the moment we have plans and we are waiting for our management to come up with the contract until 2007. That means a lot of things to do! My last question: You have achieved many things throughout your career. You must have walls of memorabilia. Which is the moment that you would consider the most important from your career and why? U.D.O: Yes, that is probably the case. On the last tour we played with UDO in Moscow, we performed a song, the chorus of which is written in Russian (I believe that UDO was referring here to the song 'DayStill' which he recorded with the cult Russian outfit Aria). The audience started singing and it was like nothing I had experienced before. Of course, I have had many good moments with Accept and I also remember the period when I released the first UDO album, when we played before 32,000 people in Dortmund at a festival and I had everyone singing to the lyrics of 'Princess of the Dawn'. But this moment in Russia�You don't think about money or business during times like this. It gives so much back to you and this is why I am doing this - to get this feedback. I wish you many more moments like this in your career and congratulations for the new album. Thank you very much for this interview.